No matter the project, no matter the cause, if an international organisation fails to take account of its impact on local people, there are going to be serious problems. 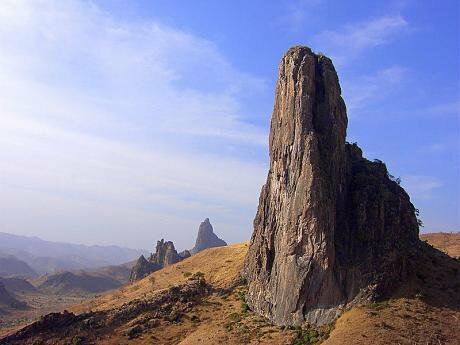 Rhumsiki Peak in Cameroon. Wikimedia/Amcaja. Some rights reserved.Take the world’s largest conservation organisation, the World Wildlife Fund (WWF). Most are in agreement that steps need to be taken to protect the environment and conserve endangered species. To this end, WWF is highly active in regions like the rainforests of Cameroon, which are among the last bastions of tropical forest around the world, and home to many endangered species of flora and fauna. WWF proudly counts the Boumba Bek and Nki National Parks in southeast Cameroon among its key achievements. It can rightly claim that these parks would never have got off the ground without its financial muscle and technical know-how, and that its logistical support for the ecoguards who now patrol the park boundaries has been equally crucial. Not until it surveyed the vast swathes of territory now enclosed within these parks did WWF discover that almost all of it was used by local tribespeople: Baka “Pygmies” who collect food, medicinal plants and other resources from the forest, which also contains a number of their sacred sites. Earlier surveys had failed to reveal any of this because, according to WWF’s regional coordinator, they had “only taken into account land used by sedentary farmers. The mode of occupation and exploitation by semi-nomadic hunter-gatherers were largely invisible and ignored.” WWF had therefore seen no need to obtain the consent of the Baka to enclose their land in national parks, or even to ensure that the park management plans would allow the Baka access to vital resources. Baka camps found inside the parks were being razed to the ground, their property seized or destroyed. Over time, however, the Baka learned the error of their ways. If they ignored park boundaries they were regarded as criminal trespassers. Reports began to circulate that Baka camps found inside the parks were being razed to the ground, their property seized or destroyed, and that the people themselves were beaten and threatened with worse if they tried to return. In raids on Baka villages outside the national parks, ecoguards were said to search huts without warrants and to use brute force in their interrogation of ‘suspects’ (sometimes on WWF premises). Several Baka are reported to have died from their injuries. The recent expansion of the illegal wildlife trade has served only to aggravate these problems, as human rights have come to be regarded as simply another casualty in the war against the poachers. WWF might have avoided this toxic situation if it had made proper investigations before committing to these new parks; in other words, if it had exercised what is commonly known as “due diligence”. This is a basic business tool that companies have used for years to manage their legal and commercial risks, and that they must now use to avoid complicity in rights abuse under the UN Guiding Principles on Business and Human Rights. UNGP due diligence requires companies to identify the actual or potential impacts of their operations, to prevent or mitigate those impacts and to account for how they have done this. Only then can they “know and show” that they have respected the human rights of those affected by their operations. It follows that businesses must actively seek out information about the negative human rights impacts of their current activities, and about the risk of future impacts. This process should begin before the project is taken on and continue throughout the project cycle. Due diligence also requires a company to provide a remedy for any rights violations that it identifies, and to take appropriate steps to prevent further violations. Identical principles apply to the conservation movement — not least because, especially in isolated areas, the impact of an ill-considered conservation programme can be more dramatic than even the largest commercial project. Unlike mines and refineries, which usually have a finite lifespan, the hundreds of parks and reserves which conservationists have helped to create and now manage are intended to continue indefinitely. As in Cameroon, this may also mean that they indefinitely exclude the people who most depend on the resources that these parks contain. Matters are made worse by the incapacity of tribal peoples to hold conservation organisations to account for their actions, however adversely they are affected. They cannot sue because they have no money for lawyers and because national laws are invariably stacked against them. They cannot complaint to mediators or arbitrators because none are available. They cannot even buy shares in WWF, Conservation International or Wildlife Conservation Society and ask awkward questions at their AGMs, because these organisations do not have shareholders. Senior executives are answerable for their actions, if at all, only behind closed doors. With this virtually unbridled power comes — or ought to come — a heightened responsibility to ensure that wildlife protection does not trump human rights, and that due diligence is therefore placed at the core of conservation activities. Unfortunately, the evidence suggests that it still lies very much at the periphery. The leaders of the conservation movement have certainly been prepared to make the right noises. WWF and the others have formed a consortium through which they formally promise to “conduct prior evaluations of the scope of proposed projects”; to “ensure that potentially affected persons are able to participate in decision making about relevant interventions”; and to “respect the right of indigenous peoples to refuse their free, prior, informed consent to interventions directly affecting their lands, territories or resources”. These are elemental precautions that they must be seen to have taken if they are to respect the most fundamental right of tribal peoples’ under international human rights law — their right to self-determination. Over six years after these commitments were first announced, however, most consortium members are still not able to “know and show” how they will conduct the due diligence necessary to put commitments into practice. There is no one-size-fits-all approach, but the essential components of conservation due diligence can be easily identified. Responsibility for due diligence should always be allocated to named individuals within the organisation, so that the rest of us will know where the buck stops. These individuals should be properly trained and given the resources they need. They should have unrestricted access to the senior personnel who decide whether and on what terms the project will go ahead (or brought to an end). They should have the same access to the local staff who will actually manage the project on the ground, and who may not support or even be aware of an official commitment to indigenous rights issued in another continent. These organisations have a positive duty to track their own performance, particularly in isolated areas where there is no one else to do so. They should communicate directly with the affected community from the outset, if necessary with the help of local NGOs, and ensure that locals are told about any potential adverse impacts. They should inform themselves of customary rights and claims in the project area, of the status of these rights under national and international law, and how they are likely to be affected by the programme. They should usually organise participatory maps to identify the territorial extent of tribal rights, and take whatever other steps are necessary to ensure that the organisation will not itself violate these rights. Conservationists must investigate how the host government has treated tribal minorities in the past, because otherwise they cannot otherwise assess how likely it is to protect their rights in the future. In particular they need to know whether tribal people have been removed from or denied access to a project area, and if so whether they agreed to this. They should satisfy themselves that any restrictions imposed on local access to the project area are legitimate, and that the officers who are supposed to enforce them can if necessary be brought to book. The control of park boundaries will inevitably have an impact on the human rights of people found inside them, and conservationists can only ‘assess’ the impact as acceptable if they first satisfy themselves that abusive scouts or rangers will be disciplined or, if necessary, dismissed. It misses the point to say — as many do — that conservation organisations cannot control officers they do not employ. Due diligence also requires conservation organisations to continuously monitor how in practice they and others respect indigenous rights. Many conservationists still believe that they need only act if and when they receive a credible report of their abuse of human rights. But this not correct, as the UNGP make clear. These organisations have a positive duty to track their own performance, particularly in isolated areas where there is no one else to do so. As is equally plain from the UNGP, they must share the information they collate with local communities, and provide a means by which indigenous grievances related to conservation projects can be resolved in a fair and timely manner. Without this, the gap between paper aspirations and the practical reality can only widen. So, duly diligent conservationists will undoubtedly have their work cut out. The process should, however, enable them to avoid much of the damage they have inflicted on indigenous communities, and maybe even the damage they have inflicted on their own reputations. There is help at hand for those who need it. The Danish Institute for Human Rights, for example, has developed a database called the Human Rights Compliance Tool (or HRCT). This includes almost 200 questions which enable companies to assess whether they meet human rights standards, and which they can customise to suit their particular requirements. The Conservation Initiative for Human Rights. Members include IUCN, Birdlife International, Conservation International, Fauna & Flora International, The Nature Conservancy, Wetlands International, Wildlife Conservation Society, and WWF.